lawNEWS 46 You can’t take them with you » Restraint of trade cases against brokers wanting to contact former clients are increasing. Here’s why. 16 Lessons from Black Saturday » Royal commissioners and insurance personnel alike learned a lot. 18 Working in a two-speed market » Marsh’s local chief talks about premium differences, hesitant insurers and growth ambitions. 20 Setting up for 2020 and beyond » QBE’s new regional chief is geared up for growth, new challenges and competition. 26 Hard market? Soft market? The search for consensus » How accurate – or useful – are the terms used to describe how premiums are performing? 28 Power from the people » The workforce is strong as Wesfarmers Insurance builds momentum. 30 Making some adjustments » ‘Traditional’ claims experts are working to evolve with the times. 32 It’s hardly mutual » Perth-based Capricorn Mutual provides ‘insurance-like’ products – but it doesn’t answer to APRA. Governments can soften the cost of a catastrophe with public-private partnerships. 38 Take a look at us » Brokers are increasingly using advertising to expand their business horizons. 42 A matter of life and death » Yours, that is. And this is all about personal risk management. Suncorp brand Apia, formerly known as the Australian Pensioners Insurance Agency, has again topped the list of insurers that customers would recommend to a friend. It’s the second time the company has scored well in the annual survey of customer experience outcomes in the motor and property insurance sectors conducted by Brisbane consulting firm Engaged Marketing. Apia’s motor insurance operation scored 8%, and its property insurance operation scored 5%. All other motor and property insurance companies surveyed received negative scores, with motor insurers recording an average score of minus 18%, and property insurers an average of minus�22%. Someone somewhere appears to have Allan Manning’s happiness as a high priority. The Melbourne-based loss management guru was very happy indeed with being awarded the Innovation award at the Australia and New Zealand Insurance Industry Awards in August. As he accepted the award (above) in front of around 800 of his industry peers [ANZIIF awards pictures, page 58] Dr Manning added: “The only thing that could make me happier than I am now is for governments to get rid of the fire services levy.” Dr Manning has been an outspoken opponent of the levy system, and has campaigned for its removal. A few weeks later his wish was well on the way to being granted. 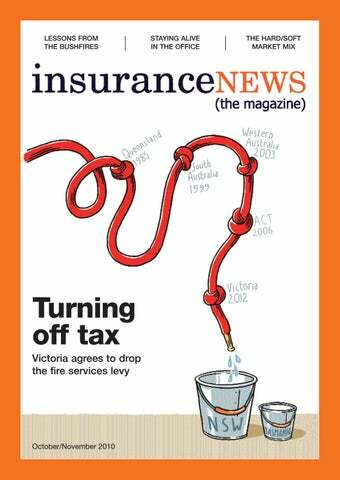 Victoria broke ranks with New South Wales to announce it will replace its fire services levy in 2012 [cover story, page 10], bringing it into line with most other states. Competitive but solid The battle for supremacy in personal lines insurance continues, with even more competitors emerging in a bewildering variety of distribution channels. But that isn’t stopping the major insurers selling more policies and pushing premiums up. KPMG says in its latest report on the general insurance industry that gross written premium increased by 6.3% to $37.6 billion in the last financial year, compared to $35.4 billion in the 2009 financial year. The professional services firm’s annual industry survey says the impact of newer players on the insurance market has been limited at this stage, and the major players – Suncorp, IAG, QBE and Allianz – continue to dominate even as personal lines becomes increasingly commoditised. Listed insurers that follow the June 30 financial year have reported some encouraging results. Suncorp, for example, reported strong full-year results, more than doubling net profit after tax to $780 million, up from $348 million last year. IAG’s result wasn’t so happy, but there were nevertheless signs that the group is continuing to move confidently forward after several years of horror returns. The insurer reported a $493 million profit, experiencing a blowout in natural disaster claims similar to Suncorp’s. But problems in its UK operations also let IAG down. Chief Executive Mike Wilkins (above) says the local market “remains challenging”. “But we are implementing rate increases of up to 20% across most classes of business, exiting unprofitable broker relationships and strengthening underwriting and actuarial resources.” Wesfarmers Insurance reported a slight drop in gross written premium for the year, with premiums falling 0.8% to $1.34 billion. Nevertheless, its earnings before interest and tax and amortisation were up 27.8% to $131 million. August is typically regarded as a moody month in the northern hemisphere, when seasonal change brings unpredictable weather. This year it was particularly bad. In Europe, the historic onion-shaped spires in Moscow’s Red Square all but disappeared as huge bushfires swept around the Russian capital during a record heatwave. Munich Re says the whole period from January to the end of September has been terrible, with 725 weather-related events costing the global industry more than $18 billion. In fact, 2010 has so far been the warmest year since records began more than 130 years ago, and Munich Re says the 10 warmest years during that period have been within the past 12 years. high salaries and excellent incentives gone forever from the insurance sector? While insurance recruitment is starting to pick up again, experts say it hasn’t yet returned to the boom years before the global financial crisis. As the Insurance News Jobs website has demonstrated over the past couple of months, there are plenty of insurance jobs available for qualified professionals. But replacing professionals is now a slow and sometimes painful process because many companies aren’t rushing to offer big bucks. While some companies spent the past couple of years clearing out their under-performers, they’re being careful with restructuring to find the right people to “fit in”. New man at Chartis: Noel Condon (above) is a US-born Irishman with a wealth of insurance experience. He has moved to Sydney from Brussels to take up the chief executive’s role at Chartis Australia, replacing new Asia-Pacific President and Chief Executive Chris Townsend. A 26-year AIG veteran who worked in the Australasian market some 10 years ago, Condon most recently held a six-year appointment as Country Manager Belgium. While the virus didn’t mutate into a more lethal form during the pandemic, WHO says H1N1 is likely to take on the behaviour of a seasonal influenza virus and remain in circulation for a number of years. Director-General Margaret Chan says even in the post-pandemic phase, localised outbreaks “may show significant levels of H1N1 transmission”. The latest Lloyd’s 360 Risk Insight report – “Globalisation and Risks for Business” – identifies pandemics as one of the top risks businesses face due to increased international travel and trade. swine flu virus has “largely run its course”, according to the World Health Organisation (WHO). But it’s in what is called the “post-pandemic phase”, and it’s still hanging around. Here come the locusts: They can fly vast distances, eating everything green in their path. There are billions of them. And they’re on the way. They’re locusts – the Australian plague locust to be precise – and they’re forming in great numbers in inland New South Wales, southern Queensland, northern Victoria and central South Australia. State governments are predicting this will be the worst locust plague for 75 years. Aided by abundant rains and the onset of warmer weather, they’re expected to spread south over the next couple of months. While agricultural insurers don’t offer cover against locust plagues chomping their way through farm paddocks and crops – experts say it’s simply too hard to assess the associated risks – they’re still worried. Next year’s crop insurance premiums will be based on this year’s harvest, which could be severely disrupted by lower yields caused by the locusts. In that case next year’s crop premiums will be far lower than they should be. Reinsurance delivers in the Shaky Isles: Reinsurance, it seems, has never been so important. And last month’s Christchurch earthquake [see story, next page] has demonstrated just how important it is in keeping insurers in balance. A new report by Aon Benfield last month said most insurers with claims from the earthquake won’t exceed their reinsurance limits, thanks to insurers taking a conservative approach to the amount of reinsurance they buy. It seems insurers in the Shaky Isles purchase catastrophe protection based on a “scenario” approach – and they obtain it at greater levels than insurers in other parts of the world. Aon Benfield’s Head of Analytics in Australia/ New Zealand Ben Miliauskas says the key scenario is a quake in the capital, Wellington. That city sits astride a major fault line, has a population of around 390,000 and has a recurrence period of about 700 years. Miliauskas says the Christchurch earthquake will impact local insurers’ catastrophe reinsurance programs “to a lower to mid-layer at best”. The quake and the devastating hailstorms which swept through Melbourne and Perth in March haven’t done much to disturb the peace of global reinsurers. But the easy access to capital that is keeping the reinsurers buoyant is seen as a potential danger. Research house Moody’s has given a “negative” outlook for the global reinsurance market in its Global Reinsurance Outlook. The other major ratings agencies give reinsurers a “stable” outlook. Australian Taxation Office’s Project Wickenby, a long-running campaign to investigate international tax evasion, has thrown up some famous names over the past few years. Now it has involved a lesser-known figure, colourful Sydney insurance executive Charles Pratten. Last month Pratten was arrested by federal police in Sydney and charged with seven counts of obtaining a financial advantage by deception and one charge of threatening to cause serious harm to a Commonwealth public official. Pratten is the principal partner of Rural & General Insurance Brokers, a company which has had more than its fair share of difficulties with the authorities in the past. Prosecutors allege Pratten has a massive tax shortfall linked to 165 international funds transfers totalling $5 million made over a sevenyear period. Pratten owns Vanuatubased Commercial Pacific Insurance, formerly known as Rural & General International Insurance, which has links to the Sydney insurance brokerage he now heads. Fairfax media reports said Australian Federal Police are expected to accuse Pratten of involvement in a tax fraud scheme masterminded by Vanuatubased accountant Robert Agius, who has been in custody since being arrested in Perth in April 2008. ON AUGUST 27 VICTORIAN PREMIER John Brumby agreed to abolish the state’s controversial fire services levy (FSL). It was a remarkable change of direction for the man who in 10 years as state treasurer and then premier had fought to retain all insurance taxes. That’s why, after nearly 10 years of rejections, denials, anti-insurer hostility and internal government “inquiries”, Mr Brumby’s announcement that the levy will be replaced by mid-2012 came as such a shock. In all things political there’s a need for spin, and Mr Brumby’s political conversion certainly deserved a good bit of it. Treasurer John Lenders provided plenty with a statement following Mr Brumby’s announcement that he would accept all but one of the royal commission’s recommendations. “The Brumby Labor Government is taking the tough decisions and doing the hard work to keep Victoria fire-ready and safe,” Mr Lenders said. “This reform will ensure that our fire services are funded more sustainably while also taking the squeeze off the cost of property insurance. “However, the royal commission was silent on the fine details of how the levy would operate and our government will work through how such a levy would be applied. “We want to ensure that the necessary funds are raised to sustain our crucial fire services. “This reform will ensure that everyone who has a property protected by our world-renowned firefighters contributes to their budgets.” Volume II, Part II of the 2009 Victorian Bushfires Royal Commission’s final report runs for 429 pages. Only five pages directly cover the subject of the fire services levy. The “evidence” Mr Lenders relies on to justify his leader’s aboutface is simply a patchwork of previous findings. The royal commission notes that several reports, including the 2003 HIH Royal Commission, 2008 NSW tax review and 2001 Victorian tax review, have already called for the levy’s abolition. The levy issue is but a tiny speck in the royal commission’s spectrum. But regardless of the rationale, Victoria now joins Queensland, South Australia, Western Australia and the Australian Capital Territory in adopting a land-based property levy. But while campaigners are delighted at winning the long battle in Victoria, there’s still a long way to go before Australia joins most of the western world in restricting insurance taxes to encourage blanket take-up. Leading abolition campaigner Allan Manning put it in perspective best in a statement praising Mr Brumby’s “leadership and statesmanship”. “Hopefully, the state governments of New South Wales and Tasmania will follow [Victoria],” he said. “The fight will go on until all Australian states – and New Zealand – drop their unfair taxes on insureds.” Dr Manning, the Chief Executive of loss management consultancy LMI Group, sees the abolition of the levy as a battle won, with the war on insurance taxes still to be fought and won. That’s because all Australian state and territory governments still add GST to the cost of the premium, and then add stamp duty. These “cascading” taxes are designed to maximise the governments’ total tax on insurance. Having rid itself of a major irritation in the form of Victoria’s inequitable and opaque fire services levy, there are therefore still plenty of tax-related issues left to address. Mr Brumby would probably have been aware of the impending release of a report into state government taxation and debt by the powerful state parliamentary Economic Development and Infrastructure Committee. The committee’s inquiry results, released on September 16, call for, among other things, consideration of ways “state taxes on insurance may be minimised or abolished over the long term”. It also calls for the minimisation of cascading taxes, noting that where they are applied to insurance premiums they are literally “a tax on a tax on a tax”. The Victorian Government’s change of stance over the fire services levy proves that change is possible where the arguments and the electoral environment are right. If politicians can recognise that the insurance taxes which remain are disincentives to adequately insure, there’s hope that more change can eventuate. The industry still has a long way to go before the * last illogical tax on insurance is abolished. Words that couldn’t be ignored Recommendation 64: The State replace the Fire Services Levy with a propertybased levy and introduce concessions for low-income earners. THE VICTORIAN BUSHFIRES ROYAL Commission’s analysis of the fire services levy (FSL) and its conclusion take up only four pages of the fourvolume final report. The only two headings in the section discussing the levy are “Inequity” and “Lack of Transparency”. While polite in its tone, the royal commission’s comments were enough to shift a seemingly immovable government into an acceptance that change is necessary. Outlining the current system which funds 75% of the Metropolitan Fire Brigade and 77.5% of the County Fire Authority, the royal commission expressed concerns about the manner in which the FSL is calculated, collected and accounted for. It noted that it is up to insurers to determine how much extra they charge to home and contents insurance customers to recoup the costs of their statutory contribution. It also found that as fire and bushfire risks make up “one of many” risks factored into insurance premiums, domestic property premiums are a “very imperfect proxy for fire and bushfire risk”. On this basis the royal commission determined that the FSL is inequitable, noting that “those who do not insure or who underinsure avoid making a proportionate contribution to the funding of fire services, but are afforded the same protection as those with insurance”. Insurers’ statutory contributions must be paid in advance of premium collection, and the royal commission found the difficulty in forecasting the market “can result in tax collections that vary considerably from the amount required as a statutory collection”. It found there was plenty of evidence that underinsurance and non-insurance is a major problem, disagreeing with the state’s suggestion “that, in the absence of further data on insurance levels, [the state] is not in a position to conclude that a change to a more equitable model is necessary”. It pointed to evidence that in the four years to 2003, insurers over-collected the FSL by $50.73 million. The commission also found the FSL places “an unreasonable tax burden on insurance policyholders”. Terry McMullan asks the questions, Vince McLenaghan, the Chief Executive of QBE’s new Australia Asia Pacific Division, responds. QBE HAS AMALGAMATED THE Australian and Asia-Pacific divisions under your control. What’s the thinking behind the change? The change is all about planning – for what the industry will look like in 2015, 2020 and beyond. In 2005 we did a lot of work with Mike Goodwin and his team in Asia in getting the shared service model right at the back office, but what we never did was get the front office engaged solidly, so we were each doing our own things. While there was a lot of work involved, and we ticked all the boxes and the work was successful, there was a lot more that we could have done in the joint development space. I know we are starting to do that now in the IT space, with a jointly supported applications development centre in Manila in the Philippines. There’s definitely scope for Terry Ibbotson in his new role as Global Head of Distribution and his team to also bring this customer focus and front-end collaboration a little more tightly together. Terry’s recent appointment was a strategic move to support our worldwide intermediary strategy amid changing market circumstances. It made sense for us to invest in aligning our business with brokers’ strategic initiatives, both by geography and market sector. We have a wonderful business in Australia, and this role offers me the opportunity to work with our teams to make it even greater. Vince McLenaghan’s new role at QBE encompasses operations in 17 countries and generates annual gross written premium of more than $US4.5 billion. His move in August from the position of Group Chief Operating Officer (the position has been “retired”) and Acting Chief Executive Australia to Chief Executive of a new division combining the group’s Australia and Asia-Pacific operations caused some stir in the market. Mr McLenaghan is now placed alongside the chief executives for Europe, Steve Burns, and the Americas, John Rumpler. Asia-Pacific Chief Executive Mike Goodwin, whose performance in the role has brought plaudits, will remain in Singapore, retain his role and report to Mr McLenaghan. The four executives join Global Head of Distribution and former Chief Executive Australia Terry Ibbotson as part of the Group Operations Executive. QBE now operates in 49 countries with over 13,500 employees and around $US14 billion of annualised gross written premium. The Australia Asia Pacific division alone covers 16 countries. not dried up yet. The Australian market is dominated by just four or five insurers, so what makes it so competitive? There are still the dominant players out there, but we’re seeing more and more foreign entrants into the market, which could very well pose long-term threats to the major insurers. They wouldn’t be here unless they thought they had any chance of making a real impact. In general, they’re offering customers lower cost and simplified methods of obtaining insurance; they’re skipping our traditional intermediated structure. “The industry will be shaped by new and blended distribution channels, new business models, increased commoditisation and more players” challenge that we’re really working hard to address. The challenges are still there, but the good news is that we’re already engaging with our staff to find alternative models that will sustain our leading posi* tion. Property Casualty Underwriters (AICPCU) takes the definitions further: a hard market is one in which “insurer competition diminishes, buyers have difficulty finding coverage, premiums increase, and insurer profitability rises”. Market conditions where “insurer competition is intense and is indicated by widely available coverage, lower premiums, and decreased insurer profitability” would therefore be defined as soft. These definitions may suffice in a classroom setting, but they fail the real-world test. For starters, insurance line prices rarely move as one beast; directors’ and officers’ (D&O) cover, for example, has very different price sensitivities from commercial motor. And the individual qualifiers of these descriptions are vague. When does insurance pass the litmus test of being “plentiful”, “expensive” or “at a lower cost”? Expense, as any salesman will tell you, is relative to the buyer. As Depression-era American cartoonist Kin Hubbard once said, a bargain is “anything a customer thinks a store is losing money on”. The definition of “competition” is also largely a moot point. Australia is one of the most competitive insurance markets in the world, and (barring the unlikely occurrence of another HIH) this is not going to change any time soon. Plus the qualifying terms in the definitions fail to address contradictions in the market. Premiums can rise, but remain affordable. Insurance profitability can fall, while insurers remain profitable. Buyers can find D&O cover plentiful, while workers’ compensation is expensive in Victoria and affordable in South Australia. If prices are hardening in a soft market, is the market still soft? Is there a specific metric to define when a market is officially one way or the other? KPMP Head of Insurance Brian Grieg concedes that definitions on the state of the market are based on what he calls “pretty loose terms”. “It’s very subjective,” Mr Grieg told Insurance News. “You can only be fairly general when you do discuss it. “You could read two different articles talking about the same class of business which are saying different things. It may be they are seeing different things in their business and it’s very hard to compare across the market generally. “People say things they absolutely believe, but it may be different to someone else’s experience in their own business.” Mr Grieg says the industry has never been able to agree on specific definitions and must rely on generalised observations, which are often skewed for market benefit. While insurers – mostly through the pages of analysts’ reports on the industry – insist rates are rising, brokers say buyers are still in control. These contradictory price signals are further complicated by the influence of larger insurance brokers, who use their market muscle to leverage cheaper rates for their clients – a competitive advantage small brokers lack. So while the market may be very hard indeed for a mid-sized broker, his large competitor down the road is likely to be having a much easier time of it. companies are accountable to their shareholders to deliver some sort of return. They can always take out their money and put it in a different place. “If insurers don’t make a satisfactory return, shareholders will go elsewhere. In the future, the major listed insurers will be far more focused on profitable underwriting.” Mr Scott says relying on measures of profitability, such as combined ratios, to reach a hard/soft tipping point can be misleading. “The hard and soft market is meant to refer to pricing trends whereas operating ratios refer to outcomes. Pricing trends precede the underwriting outcome,” he said. JP Morgan analyst Siddharth Parameswaran provides his own hard/soft definition, and unlike others spoken to by Insurance News, he provides a technical basis. 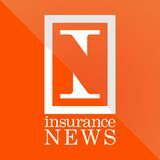 “The hard market means rates are rising above the cost of inflation,” he tells Insurance News. “This is generally coupled with people pulling out of the market, in terms of capacity.” Asked how he would define rates rising in an already depressed market, Mr Parameswaran is more circumspect. “That would be a hardening market, where rates are rising a lot and profitability is being restored,” he says. Rob Scott says he’d prefer to banish the terms and start over. But if terminology must be used, he has his own suggestion. “I think the concept of irrational pricing is a more relative term to use when describing market trends.” The journey to find a rock-solid basis for * defining hard and soft continues. at this time we see that there are a lot of opportunities for us to improve our general insurance business. He can foresee the day that the Lumley business – now a strong performer in the Wesfarmers Insurance stable – will sit next to the Big Three as the fourth pillar of the insurance landscape. “We don’t necessarily put a number on it,” he says. “But if we can keep improving, the logical consequence is that we will be a more significant player in the intermediated market. “From our perspective there is no clear leader in the intermediated market in Australia and New Zealand, so that’s what makes it exciting for our team. “The Wesfarmers Insurance business model is very focused on the intermediated market across Australia and New Zealand and most of our partners recognise this commitment. So in that context Lumley is seen by many as an attractive alternative – strong brand, strong team with a strong and stable shareholder.” Several years ago no one would have considered Lumley, cast as something of an industry laggard, as a competitor on par with IAG, Suncorp and QBE. What was a small fish lacking capacity and technical ability outside of commercial motor has come a long way in a short time. Mr Scott says forging new partnerships has been an important facet of the new, bolder Lumley across both sides of the Tasman. “We have focused on trying to broaden our broker relationships and tailoring our approach to the needs of different groups of brokers,” Mr Scott says. “Traditionally Lumley in Australia was focused predominantly on relationships with regional and independent brokers and didn’t do much business outside of commercial motor with larger broking groups. “Initiatives such as expanding into the corporate market through our Corporate Solutions team have been a great way to improve our profile among the larger national and international brokers. “This business isn’t solely price-driven; often it is to do with the quality of the underwriting and being able to come up with innovative solutions.” While Lumley seeks to build a larger corporate profile, other lossmaking businesses have been systematically culled, a strategic withdrawal that Mr Scott says is nearing completion. “That was a just a necessity in terms of getting the business back on track,” he says. “Really it was a combination of exiting business where we were not only losing money, but where we didn’t have enough control around pricing or risk selection. “And if we can’t control the pricing and risk selection, and if it’s a lopsided relationship then it’s not one that we want to be in.” Amid all the attention over Lumley’s new found vigour, its transTasman sibling is certainly not being ignored. While operating in a smaller market, Lumley New Zealand has the advantage of being an intermediary-focused insurer in a sector dominated by brokers. Mr Scott is clearly very happy about Lumley NZ’s long-term prospects under Chief Executive John Lyon. “We still see that there’s a lot more potential for Lumley New Zealand,” he says. “We already have started to adopt common approaches to portfolio management, reinsurance, capital management – a number of initiatives that are common across our Australian and New Zealand businesses. A DMF may be a trust, mutual, company limited by guarantee or other structure. And because of their discretionary nature, they are not regarded as insurance companies and therefore aren’t required to be authorised by the Australian Prudential Regulation Authority (APRA). And while DOFIs have been extensively examined and arrangements set in place to control their activities, DMFs have slipped under the regulatory radar. In April 2008, then-Assistant Treasurer Chris Bowen announced limited exemption arrangements to the Financial Sector Legislation Amendment (Discretionary Mutual Funds and Direct Offshore Foreign Insurers) Act 2007. But the Act was primarily aimed at DOFIs, the legislators doing a Solomon-like job in limiting brokers’ access to DOFIs while half-meeting insurers’ concerns by declaring that anything else would be subject to the same regulations as other insurers. In September last year Treasury extended reporting rule arrangements for business placed with DOFIs, forcing insurance brokers to collect data on insurance contracts with APRA-authorised general insurers, Lloyd’s underwriters and DOFIs. But what about discretionary mutual funds? A threeyear period of reporting annual results to APRA ended at the same time as DOFI data-collection was steeped up. natives”, include protection for business buildings, contents, stock and assets, business interruption and liability, home and contents, motor and public liability. While Mr Bartlett won’t disclose the commercial sensitivities of CML’s pricing, the advantages of existing outside the onerous obligations of the Insurance Act 1973 or APRA oversight are obvious. “An essential feature of mutuality is the pooling of a layer of risk among the members,” he says. “Effectively the members are self-protecting on a group basis. “This is a form of co-operation which is at the heart of the co-operative movement – the group acting collectively to achieve benefits that individual members could not achieve alone.” Mr Bartlett is adamant the main gripe of insurers – that DMFs are simply offering insurance by any other name – is not valid. “CML considers it should not be subject to the same level of regulatory protection that may be appropriate for a retail consumer dealing with a profit-driven commercial insurer, and this approach is supported by Australian law. “Insurance and the protections offered by a discretionary mutual are different in substance, and there is legal authority to this effect.” Mr Bartlett says a balance must be achieved between the “full weight of regulation” appropriate to a commercial insurer and the “lighter touch” reflecting the “different risks associated with a not for profit, self-protecting group like CML”. “To obtain its Australian financial services licence CML had to submit detailed financial accounts to the Australian Securities and Investments Commission (ASIC) demonstrating that it had sufficient capital and financial reserves,” he says. “A key licence condition for CML is to always have assets that exceed its liabilities. As such it is required to provide ASIC with its audited accounts and to report to ASIC if at any time it is unable to meet its licence conditions.” Mr Bartlett says DMFs like Capricorn are vital to a thriving, competitive risk market. “Despite discretionary mutuals like CML being smaller in size compared to insurers, discretionary mutuals are beneficial in providing choice and competition in a free market, as well as being able to provide tailored protection and benefits for members, and a collective ownership and control model that supports the economies in which they operate” he says. For the time being at least, it appears regulators agree. Case study: California Earthquake Authority In January 1994, the Northridge earthquake struck Los Angeles, killing 72 people and injuring nearly 9000. The 6.7-intensity quake caused more than $US15 billion ($18 billion) in insured losses, including widespread damage to public infrastructure such as roads and hospitals. Following the quake, the Californian Government issued a decree compelling insurers to offer earthquake insurance. This led many companies to withdraw from the Californian market, restricting supply. In response, the state government created the California Earthquake Authority (CEA) in 1996, which allowed insurers to offer earthquake coverage without retaining the risk. The CEA is publicly managed but privately funded, with Swiss Re assuming the underlying earthquake risk through reinsurance and the use of capital markets. Since 2001, Swiss Re has securitised almost $US2.3 billion ($2.7 billion) of CEA’s * earthquake risk. MORE INSURANCE BROKERS ARE HEEDING THE WISDOM OF American marketing psychologist Steuart Henderson Britt, who famously said that doing business without advertising “is like winking at a girl in the dark: you know what you are doing, but nobody else does”. Since the National Insurance Brokers Association (NIBA) ran its “every business needs an insurance broker” billboard and radio campaign in 2006/07, some brokerages have taken up the challenge to advertise their services rather than rely merely on market forces, client references and the occasional brochure. While advertising is never cheap, it is effective if the message is right for the audience. And the creative approaches are what make them successful. One company uses the eyebrows of former federal opposition leader John Hewson to arrest the attention of passers-by in the high-traffic area outside Sydney Airport’s domestic terminals. Another uses a purely “local” TV campaign to assure residents of his country town that he’ll be there when they need him. Large or small, brokers’ campaigns provide a wider service by building recognition not only of the individual company, but of the importance of insurance brokers in dealing with commercial risks. Brokers have proved to be cautious about expensive advertising campaigns. Following the success of its 2006 “Needabroker” campaign, NIBA last year failed to get a new nationwide campaign based around the value of “NIBA brokers” off the ground. Only 42% of members agreed to contribute to the cost of the threeyear campaign – even though the association was seeking only $500,000 of the total $1.8 million cost. While some NIBA members questioned what they would get out of a campaign promoting their affiliation with a trade association rather than a set of values or service excellence, “it’s still difficult to understand why they would choose not to back an initiative to promote the profession that provides their livelihoods”, NIBA Chief Executive Noel Pettersen said at the time. Perhaps that’s because many brokers now believe they can spend their advertising dollars better promoting their own business interests. It’s likely that as competition in the broking sector intensifies over the next few years, even more will turn to advertising to expand their horizons. Competitive or not, only one medium-sized brokerage refused to discuss its advertising campaign with Insurance News, protesting that it didn’t want to “give away our marketing secrets”. about $40,000 a year on television, radio and print advertising. While he doesn’t have the budget of the insurers, his latest television ad is effective by being short, sharp and simple. It aims to prick up the ears of the average Rockhampton resident sitting at home on the couch. the status quo”.  Mr Hines insists that’s a meaningful guidepoint rather than a vacuous platitude dreamed up by some wannabe marketing executive. “It might sound a tad cheesy but we challenge the status quo in everything we do; the way we think, the way we act, the way we communicate,” he says. “But we know this can’t be gratuitous; there must always be some intrinsic value in what we do. Rather than just being different for the sake of it, there has to be real value for the client. “Insurance is an emotional purchase and the focus should be on the relationship. We want our clients to become passionate supporters of GSA, not merely parties to a transaction – and we move mountains to achieve this.” He believes the credentials of his young staff – only a few are older than their 45-year old boss – stack up with any of the mid-sized boutique firm’s peers or indeed the big internationals. While GSA doesn’t actively measure its return on investment in things like those big Sydney billboards – “It’s very expensive, but I can’t give you any numbers” – there are other signs the firm’s innovative approach is paying off. For example, in the past two years the business has grown by 30%. sibly already heading down the path to bad health. Heart disease is killing us in droves. Cardiovascular disease is still the biggest killer of men and women alike. In fact, more women are likely to die from a coronary event than a male. There are several reasons for this, one being that women are less inclined to seek medical treatment, and when they do their symptoms are sometimes overlooked. With heart disease the best prognosis comes from early detection, prevention and intervention. So what type of “personal insurance” plan will you sign up for to ensure you have the best possible health and a good shot at a long life? * That’s entirely up to you. About the author Chris Woodley is a former Sydney firefighter turned health and fitness expert. He knows many people in the insurance industry through his wife Lisa, and believes that many of us need to take a good long look at ourselves. Chris has a degree in health science and associated qualifications in nutrition, remedial massage and sports injury therapies. A volunteer speaker for the National Heart Foundation, he also writes articles for fitness magazines. He’s a threetime winner of the Mr New South Wales bodybuilding competition, and is the current “Mr Sydney” in the over-50s division. with you, make sure that the restraint ‘carves out’ your clients from those of the organisation you are joining,” she says. “And make sure you are free to take those clients with you when you leave. “Know that if you sign a properly drafted and reasonable restraint as part of your employment agreement, you will be held to it.” Mr Edmond does not believe future restraint cases can be stopped; but they may be minimised by the employer ensuring that the new employee makes a representation in the contract he is entering into that it is not inconsistent with the terms of any other obligations he or she may be under. He also suggests the parties agree to mediate “sooner rather than later in the proceedings”. Tighter regulation is often mooted as the catch-all answer to difficulties between employers and employees, but the complicated nature of the insurance business is likely to preclude this. “The difficulty with tighter regulation is that this may discourage competition and could lead to a position where unreasonable restraints on a person are enforced,” Ms Berton says. If there is one thing clear about this murky issue of restraint disputes, it’s that they are not simply going to disappear any time * soon. NINE YEARS AFTER BROCK HALLIDAY pursued a former employee of his brokerage in court for taking company records detailing clients and policy information, he says he’d recommend other brokers follow his example. CONNECT LIABILITY SOLUTIONS HAS been renamed Newline Australia Insurance to aligh it with the global brand. Newline bought the Connect business in 2007. It specialises in public and product liability, professional indemnity, directors’ and officers’, financial institutions, medical malpractice, life sciences and clinical trials cover. The Melbourne-based operation has three underwriting managers – Christine Pistone (responsible for financial institutions and directors’ and officers’ liability); Stephen Mullaly (professional indemnity and medical malpractice) and Craig Rowsell (liability, life sciences and clinical trials). has provided key brokers with clarity around who we are, what we do and our ownership structure.” The spokesman says the initial response in the local market to the name change has been positive, “which reflects on the parent company’s standing”. Newline writes business in more than 80 countries around the world, with the Melbourne office joining underwriting centres in London and Singapore. Newline Australia writes business on behalf of Newline Syndicate 1218 * at Lloyd’s. The restructure comes on top of a decision to upgrade the Dual Web Rater, with changes also driven by feedback from brokers. The system now allows brokers to indicate, quote and bind online without referring to a Dual underwriter. This new end-to-end functionality “allows brokers to gain instant premiums and documentation”. The global Dual group also recently expanded its Lloyd's capacity, with Hiscox Underwriting providing 25% extra capacity on top of the international group’s 75% capacity with Lloyd’s syndicate Arch. Mr Coates says the move will allow Dual Australia “to expand beyond our traditional financial lines products”. “The expansion represents another great partnership for us as we continue our growth as * a specialty lines agency,” he says. policyholders the benefits of the upgraded product. Mr Hooton says he is optimistic about the future of the company’s rural business. “We’re getting good growth on farm insurance. We have a good product and good focus in that area.” ARGIS has already begun rebranding its domestic portfolio to Calliden and will now make the same transition for its commercial business. In July Calliden closed ARGIS premises in Albury, Tamworth, Toowoomba and Canberra in a move to centralise the business in Melbourne. Fewer than 30 staff were affected, with employees invited to take up positions elsewhere in the group. Development managers retain a presence in the regions. Calliden acquired a half-share in the farm specialist as part of its 2007 $62.5 million purchase of Australian Unity’s general insurance business. Following the deal, FMG Insurance – the former Australian branch of New Zealand’s Farmers’ Mutual Group – was rebranded as Australian Regional General Insurance Services (ARGIS.) In 2008 Calliden bought out the remaining 50% stake in ARGIS from Australian Unity for * $6.3 million. Even more impressively for the notoriously fickle generations Y and Z, 85% of young professionals plan to stay in the industry. Clearly, the problem is not the work itself, but the public’s perception of what a career in insurance involves. To address these problems, ANZIIF has three programs in place to promote a career in insurance. The “Why Risk It” program is a national teaching resource that fits within the existing curriculum and is aimed at improving the financial literacy of year nine and 10 students. This is built on by the “Careers in Insurance” booklet sent out to schools and universities across Australia and New Zealand aimed at broadening perceptions of how important insurance is in day-to-day life, the scale of the industry and range of roles it includes. This program is supported by ANZIIF’s website, which it plans to revamp to include a tool linking insurance professionals with career days at local schools. Finally, the “Generation i” program is designed to keep young people in the industry once they have entered it. ANZIIF is also co-ordinating a new “Know Risk” initiative, which will be an online aggregator of information on practical and financial risk management, bringing together product information and tools to assist people to get the right level of insurance. Mr Skews says this initiative has received the support of all insurance associations and bodies and by increasing knowledge of the industry will likely also improve recruitment efforts. the focus was on ensuring that people who choose to become CPAs do so for the right reasons, based on quality information. “There is an integrity in projecting really appropriate messages to people when they make their decision to move into this profession,” he says. “I like to think that everyone who decides to become a CPA does so based on not just their own image of what accounting is about but also on an appropriate, contemporary view of it.” Even with its high profile advertising campaigns, Mr Malley acknowledges CPA Australia continues to battle stereotypes when attracting new recruits. “I don’t think people generally realise how interesting, exciting and broad the range of roles are that people conduct under the banner of being a CPA,” he says. “In our membership we are literally a microcosm of society: we have got people in politics, sport, business, in not for profits and the public sector. “If you have a CPA qualification, you can literally put it in your suitcase and travel the world and be relevant to anyone.” He says this is the same challenge facing the insurance industry. “I think there is still a lot of work to be done broadly about promoting the breadth and the relevance of a career in financial services, and the value it brings to recipients,” he says. “People have a presumption about insurance that probably dates back until the time they were five and they first heard about the concept. “It is the same with accounting – people have these positions and presumptions and it is important that we surprise people about how things have changed and the contemporary nature of the work and the breadth of it.” If the insurance industry can just do this, there is no reason to think that it will have any trouble meeting the need for top-quality new recruits in the future. are not just sitting at a desk, and if you like dealing with people and you’re good at relationships, then broking is a great opportunity and it also offers great financial rewards.” While no unified industry approach to recruitment yet exists, it is clear the insurance industry is becoming more aware of the importance of promoting a positive image to the community and potential recruits. And with the industry showing it is willing and able to co-operate on issues such as underinsurance with the “Know Risk” initiative, there is still hope for a * unified approach to recruitment. Celebrating the industryâ&#x20AC;&#x2122;s achievers It was smiles all round at the annual Australia and New Zealand Insurance Industry Awards, the widest of the lot covering the faces of QBE staff who picked up the title of General Insurance Company of the Year. Now in its seventh year, the awards recognise outstanding achievement in the Australian and New Zealand insurance marketplace. Some 800 insurance industry leaders gathered in Sydney for the occasion, hosted by the Australian and New Zealand Institute of Insurance and Finance. The awards gather more momentum each year and this yearâ&#x20AC;&#x2122;s event was a sell-out, with 800 industry professionals taking the chance to get together and cheer the effort that goes into making the risk insurance business a success. UAC moves into Adelaide Brokers from across Adelaide flocked to recreation club Next Generation recently for several interesting hours. Rather than indulge in the clubâ&#x20AC;&#x2122;s recreational facilities, the brokers were there to check out the latest insurance offerings from members of the Underwriting Agencies Council (UAC). A record number of exhibitors and more than 160 brokers spent several hours discussing the wide range of specialised products UAC members deal in, then attended a light lunch. The lunchtime speaker was Lloydâ&#x20AC;&#x2122;s new General Representative in Australia, Adrian Humphreys, who spoke about the London market and its work in the Australian industry. Allianz training attracts the brokers Major insurers have become more involved in the training of brokers over the past few years, and Allianz Australia has taken the initiative one step further by tailoring its program to meet varying needs. So far this year Allianz has held training days in Canberra, Wollongong, Brisbane, Adelaide, Sydney, the Gold Coast and Geelong, reaching more than 500 brokers. Sessions have been “streamed”, providing separate topics and training targeted specifically toward broker principals, account managers and office support staff. The result has been a mix of product training, marketing tips and “area-specific” growth strategies. Each training day earns accreditation of six CPD hours or six CIP points. Allianz says feedback from brokers and agents this year will be used to design more interactive sessions, with expert speakers and specific product training already identified as a requirement for next year’s training days. APIG’s big day draws a crowd You can get through a lot of business in one day, especially when you’re as organised as the people who guide the affairs of the Australian Professional Indemnity Group (APIG). About 300 lawyers, brokers, accountants, claims specialists and other insurance liability specialists gathered in Sydney last month for APIG’s popular annual national conference and gala dinner. The Dockside event was a great chance for industry players to get together and discuss the latest issues relating to professional indemnity, financial lines and directors’ and officers’ insurance. The one-day conference format was specifically designed for the convenience of those attending the event. Apart from the more “normal” professional liability issues, the program also covered issues such as kidnap and cybercrime. The dinner that evening brought together 450 people for a memorable end to an intense day. Zurich teaches chiefs to be chefs Managers should be responsible for the things they plan and prepare, so chief executives from brokerages around Australia have been learning how to be masterchefs at Zurich’s Zenith CEO lunches. Hosted by National Intermediary Distribution Manager Nick Cook (puns were not permitted), the special lunches in Sydney, Melbourne, Brisbane, Adelaide and Perth brought 120 principals together for a culinary masterclass. And they ate what they cooked… While the bosses were learning what’s cooking, brokerage account managers and back-office staff attended 11 Gen Z forums around the country to learn personal marketing and presentation skills, claims and strategic marketing for the company. The sessions were conducted by experts in their fields and attracted more than 800 staff. peopleNEWS Claims experts gather for CC10 The annual Claims Convention hosted jointly by the Australasian Institute of Chartered Loss Adjusters and the Australia and New Zealand Institute of Insurance and Finance grows more popular year by year. The fourth convention (CC10) in Sydney last month attracted 230 representatives from a wide range of insurers, loss adjusters, risk managers, claim industry specialists, suppliers and industry associations. Organisers say the associated exhibition is the largest yet staged, featuring mainly service-providers demonstrating the latest in products and techniques. The two-day convention was marked by some lively debate and covered a wide range of topics. Speakers ranged from Lumley Chief Executive Vivek Bhatia to Insurance Ombudsman John Price. Our pictures were taken at the convention dinner held at Sydneyâ&#x20AC;&#x2122;s Luna Park. All smiles as IBANZ adjusts Problem: How to prepare New Zealand brokers for the arrival of a new regulatory regime, as well as answer their demands for more professional education opportunities. Solution: Turn the annual Insurance Brokers Association of New Zealand (IBANZ) “Propel” convention into a smorgasbord of technical seminars. Method: As IBANZ Chief Executive Gary Young puts it, switch from “inspiration to education”. Use flexible day passes to encourage a good turnout. Program five concurrent streams throughout the two days of the convention. Result: A record attendance at the Sky City Convention Centre as up to 800 brokers attend sessions and wander through the expansive exhibition area during breaks. A very happy Mr Young says the decision to try a convention venue in Auckland for the first time – after all, it’s the city where most brokers work – has been vindicated. “Our sponsors and exhibitors are happy with the large numbers of brokers they’ve met over the two days,” he says. The bosses join in at Vero Expo Building relationships with brokers and helping to increase their skills and knowledge is very important to every major insurer, and Suncorp demonstrated its serious intent in Brisbane last month when it hosted its latest Broker Expo. Commercial Insurance Chief Executive Anthony Day, Executive General Manager Intermediated Distribution Andrew Mair, and Executive General Manager Commercial Claims Paul Smeaton were on hand to speak at a panel session about the state of the market and Suncorpâ&#x20AC;&#x2122;s plans, answer questions directly and chat to other brokers in the breaks between the technically based workshops. Held in the Brisbane Hilton, the expo attracted 250 brokers, who earned CIP and CPD points for attending the accredited professional development workshops. peopleNEWS Expertise on show at lunch Loss adjusting is a far more sophisticated business than it used to be. These days most adjusters are employed by large companies with substantial reserves of expertise available. MYI Freemans recently held a lunch in Melbourne to show just how such knowledge is being harnessed by its new “expertise” division. The “launch lunch” – the first in a series across Australia – brought together claims managers and specialist lawyers to meet some members of the 50-person expertise team, who deal with claims and risk services in areas as diverse as agriculture, construction, engineering, investigations, financial, liability, major property, marine and risk surveying. IN THE GOOD OLD DAYS OF JOURNALISM, documents were left on journalists’ doorsteps in the dark of night by brave whistleblowers. These days unsolicited documents flop electronically on to the desktop via email. Sometimes they come from specially constructed email addresses, so you can’t track down who sent them. Usually such communications contain scurrilous information about individuals and the plea to “check them out”. That’s how we obtained a document from a broker recently. He thought it deserved exposure for what he called its “high level of tackiness”. Here’s what it’s about: A reputable Australian insurer, which we won’t name – they’re not doing anything illegal and for all we know there are others out there doing the same thing – is offering “points” to brokers which can be redeemed for prizes. The company has nominated a number of target occupations it wants to write business for, and will allocate one point for each commercial quote the broker completes that matches its target list. Sorry, there are no Ferraris or Mediterranean holidays available – 10 points gets the broker a lolly jar and the maximum 50 can be redeemed for gourmet hampers. So it’s not as if anyone’s going to be diverting enormous amounts of business away from other insurers in the expectation of an early retirement. The broker who brought this to our attention used phrases like “thin end of the wedge”, but we find it hard to be alarmed. If the program tempts brokers to try the insurer out when they otherwise wouldn’t bother, then that’s pretty effective marketing. If the broker gets the client a really good quote as a result, well and good. If they don’t, they still get a point for trying the insurer out, anyway. But if there’s a nagging little feeling in the back of brokers’ heads that they shouldn’t be trading quotes for movie tickets, they should maybe stop and consider if this is the sort of thing a professional intermediary should be getting involved in. However, let’s keep this in perspective. Collisions between marketing strategies and professional ethics are hardly new. Drug companies, for example, make insurance company marketers look positively tight-fisted and slothful. In that one month he was contacted by 18 different drug companies about 33 different drugs. Doctors, of course, are guided by a very strict code of ethics. So are accountants and lawyers. But what about brokers? The National Insurance Brokers Association Code of Conduct calls on brokers to “act in the best interests of the client” as well as to “be professional, efficient and responsive in all dealings”. That’s plain enough. It doesn’t say brokers can’t look around a bit further than they might otherwise (it might even be a good thing to do so). Nor does it forbid building up award points. But as with anything, if it makes you feel “tacky”, or even unprofessional, stop it immediately – you may go blind. The recent Insurance Brokers Association of New Zealand (IBANZ) convention in Auckland was an eyeopener for Kiwi brokers who have grown used to the more familiar “entertain, inform and don’t stretch anyone too much” formula. Like the upcoming National Insurance Brokers Association (NIBA) convention on the Gold Coast, professional education is now a very important part of proceedings. The IBANZ event was the first the Kiwi brokers had held in Auckland – the centre of the industry in NZ – because like most organisers, they feared losing delegates who might be lured back to their offices, never to return. That didn’t happen. IBANZ followed the example of NIBA last year and introduced “flexi-passes” to ensure they filled up a huge array of sessions – 60 of them over two days. The result was constant activity as some 800 people scurried from session to session, strolled through the exhibition hall or stopped to chat to groups of colleagues/friends. But where were the staff of the two largest brokers, Aon and Marsh, at this professional edu-fest? It transpires they didn’t share their smaller counterparts’ enthusiasm for acquiring knowledge outside their own hallowed halls. Don’t know why, but what a shame. Congratulations to the crew at the Australian Professional Indemnity Group, who announced at their recent Sydney conference that they’ll be naming a new award for excellence after the late Frank Earl, the broker who built his enviable reputation for integrity on the professional indemnity business. Lumley Head of Distribution Chris Collins announced the award while Frank’s widow Dianne and daughter Melanie looked on. Chris is the son of Frank’s oldest mate. It’s great to know that Frank’s example and * contribution won’t be forgotten.